Newly-released body camera footage shows a Nevada Highway Patrol trooper performing chest compressions on a man on the 215 near the Airport Connector exit. An amazing rescue was caught on camera. 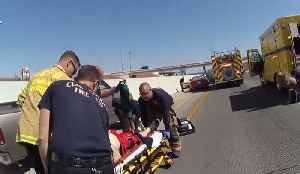 Newly-released body camera footage shows a Nevada Highway Patrol trooper performing chest compressions on a man after a crash on the 215 near the Airport..
Full video of an amazing rescue caught on camera. A Nevada Highway Patrol trooper performing chest compressions on a man after a crash on the 215 near the Airport Connector exit. 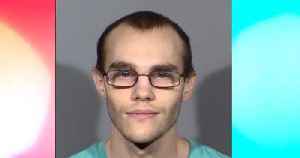 Police say Michael Mickowski made threats in a video game chat room promising to buy a gun and shoot everyone he could, including young children at schools in Las Vegas.